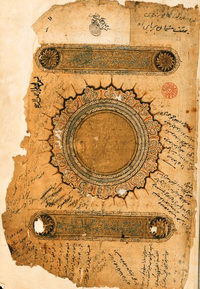 The Kimiya-yi Sa'ādat (Alchemy of Happiness) was written towards the end of Abū Ḥāmid Muḥammad ibn Muḥammad al-Ghazālī's life shortly before 499/1105. During the time before it was written the Muslim world was considered to be in a state of political as well as intellectual unrest. al-Ghazali noted that there were constant disputes regarding the role of philosophy and scholastic theology and Sufi's became chastised for their neglect of the ritual obligations of Islam. Upon its release, the Kimiya-yi sa'ādat allowed al-Ghazali to considerably reduce the tensions between the scholars and mystics.— Excerpted from Kimiya-yi sa'ādat on Wikipedia, the free encyclopedia. 1308 Persian Edition of the Text.